The vineyard is located in the Margaret River wine region of Western Australia. The 44 hectares of vines are planted mainly to Cabernet Sauvignon, Chardonnay and Sauvignon Blanc. The 120 hectares of vines are planted mainly to Sauvignon Blanc, Semillon, Cabernet Sauvignon and Chardonnay. The 24 hectares of vines are planted mainly to Sauvignon Blanc, Chardonnay and Cabernet Sauvignon. The 42 hectares of vines are planted mainly to Chardonnay, Semillon and Sauvignon Blanc. The vineyard is located in the Barossa Valley wine region of South Australia. The 131 hectares of vines are planted mainly to Shiraz, Cabernet Sauvignon and Chardonnay. 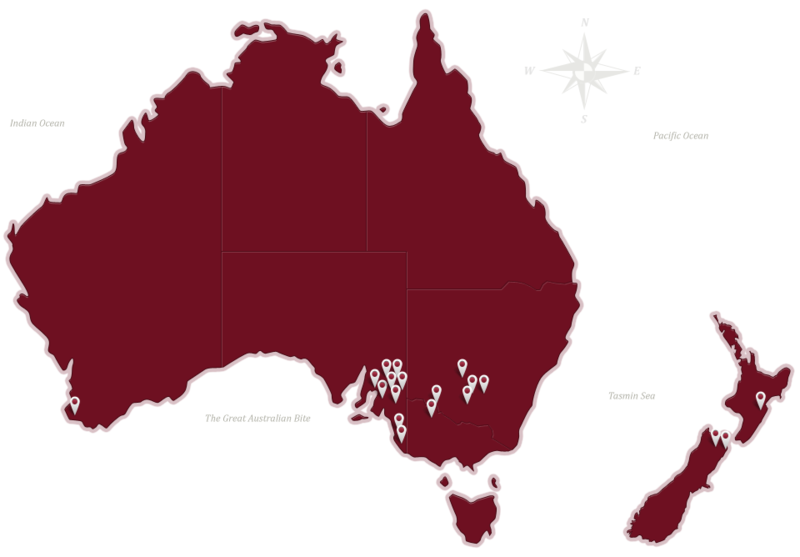 The vineyard is located in the Riverland wine region of South Australia. The 415 hectares of vines are planted mainly to Chardonnay, Shiraz and Muscat Gordo Blanc. The 171 hectares of vines are planted mainly to Chardonnay, Shiraz and Semillon. The vineyard is located in the Adelaide Hills wine region of South Australia. The 73 hectares of vines are planted mainly to Sauvignon Blanc and Chardonnay. The vineyard is located in the Padthaway wine region of South Australia. The 213 hectares of vines are planted to Cabernet Sauvignon, Chardonnay, Merlot and Shiraz. The 165 hectares of vines are planted mainly to Cabernet Sauvignon, Chardonnay, Merlot and Shiraz. The vineyards are located in the Coonawarra wine region of South Australia. The 256 hectares of vines are planted mainly to Cabernet Sauvignon and Shiraz. The vineyard is located in the Riverina wine region of New South Wales. The 629 hectares of vines are planted mainly to Cabernet Sauvignon, Merlot, Shiraz and Verdelho. The vineyard is located in the Riverina wine region in New South Wales. The 97 hectares of vines are planted mainly to Chardonnay, Semillon and Shiraz. The 394 hectares of vines are planted mainly to Chardonnay and Shiraz. The vineyards and orchards are located in the Riverina wine region of New South Wales. The 490 hectares of vines are planted mainly to Chardonnay, Shiraz, Cabernet Sauvignon, Pinot Grigio and Citrus. The vineyard is located in the Murray Darling wine region of New South Wales. The 463 hectares of vines are planted mainly to Cabernet Sauvignon, Chardonnay, Merlot and Shiraz. The vineyard is located in the Hawkes Bay wine region of New Zealand. The 292 hectares of vines are planted mainly to Merlot and Chardonnay. This vineyard is located in the Awatere Valley sub-region of the Marlborough wine region of New Zealand. The 167 hectares of vines are planted mainly to Sauvignon Blanc, Pinot Noir and Chardonnay. The vineyard is located in the main Wairau Valley of the Marlborough wine region of New Zealand. The 130 hectares of vines are planted to Sauvignon Blanc. This vineyard is located in the Marlborough wine region of New Zealand. The 130 hectares of vines are planted to Sauvignon Blanc and Pinot Gris. The 96 hectares of vines are planted to Sauvignon Blanc and Pinot Noir. This vineyard is located in the Waipara wine region of New Zealand. The 77 hectares of vines are planted to Riesling, Pinot Noir, Pinot Gris and Sauvignon Blanc. The 87 hectares of vines are planted to Riesling, Sauvignon Blanc, Pinot Noir and Gerwurtraminer. The 48 hectares of vines are planted to Chardonnay, Pinot Gris, Sauvignon Blanc and Pinot Noir. This vineyard is located in the Central Otago wine region of New Zealand. The 82 hectares of vines are planted to Pinot Noir.